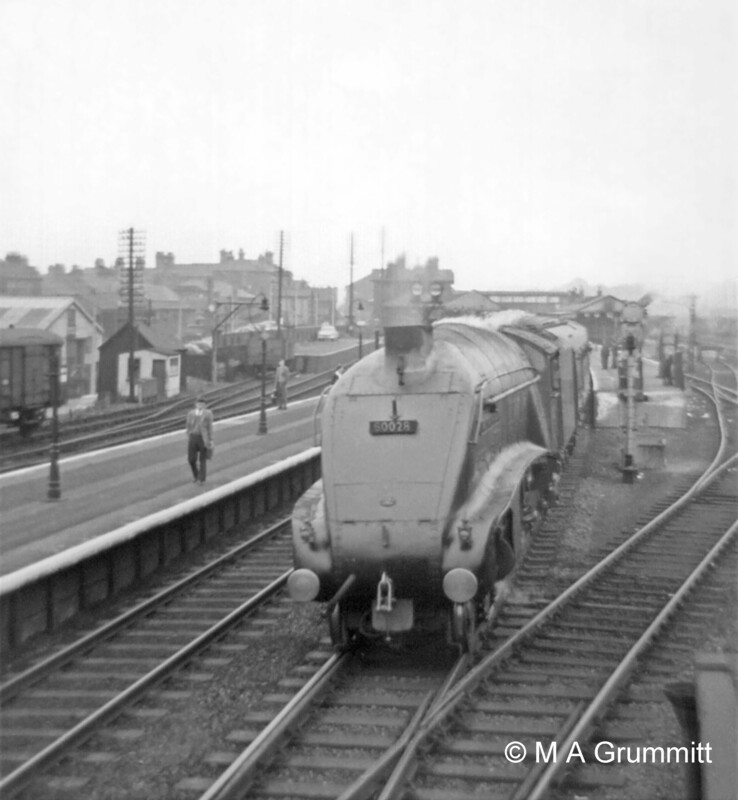 These photographs were taken by Mick Grummitt when he was relief Telegraph Lad at Grantham North box between 1959 and 62. They are all views from Grantham North signal box. 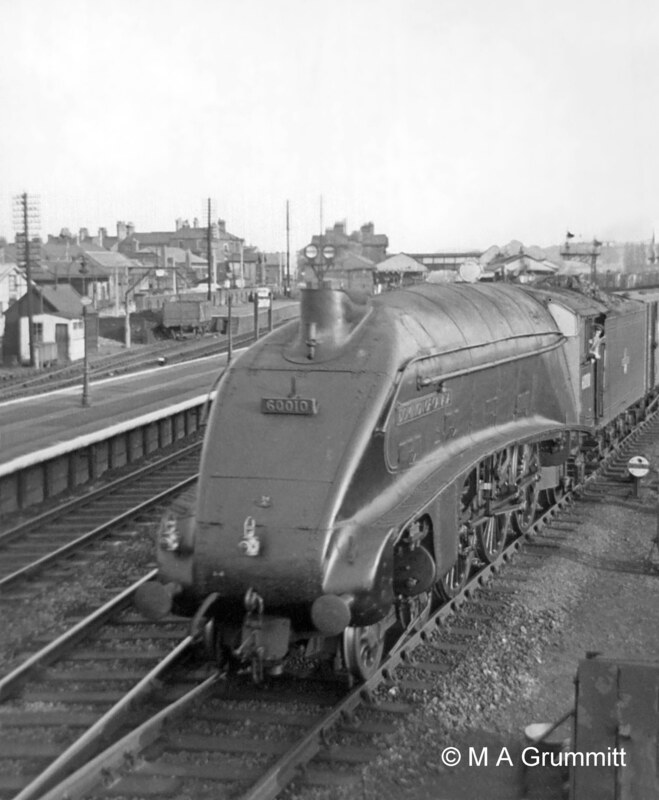 V2 locomotive No. 60893 of New England shed, Peterborough, leaves for the north. The two headlamps, one above each buffer, denote an express passenger train. 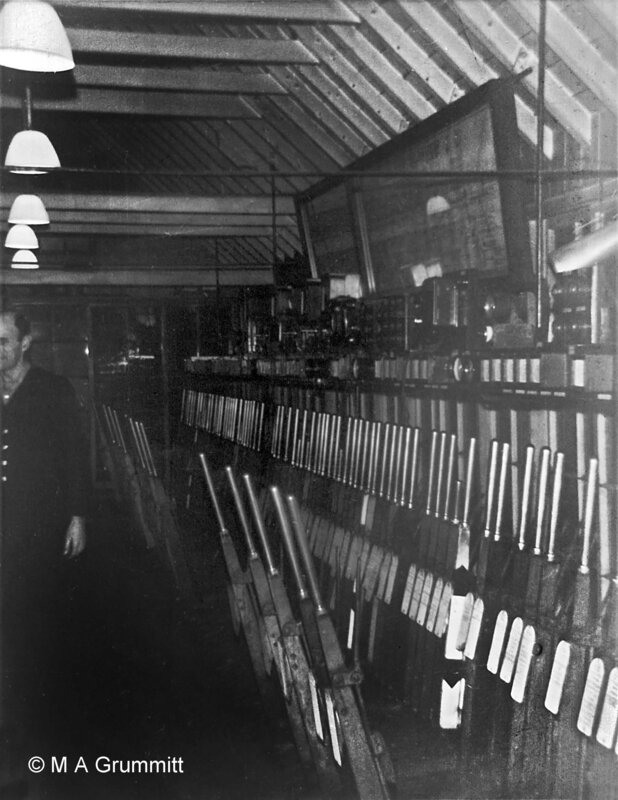 These headlamp codes were an aid to signalmen in identifying trains so they could ensure that the most important traffic was given priority. The white-painted lamp cases were themselves a visible indicator in the daytime. During the hours of darkness they were lit by an oil lamp inside, showing a white light to the front through a glass lens. 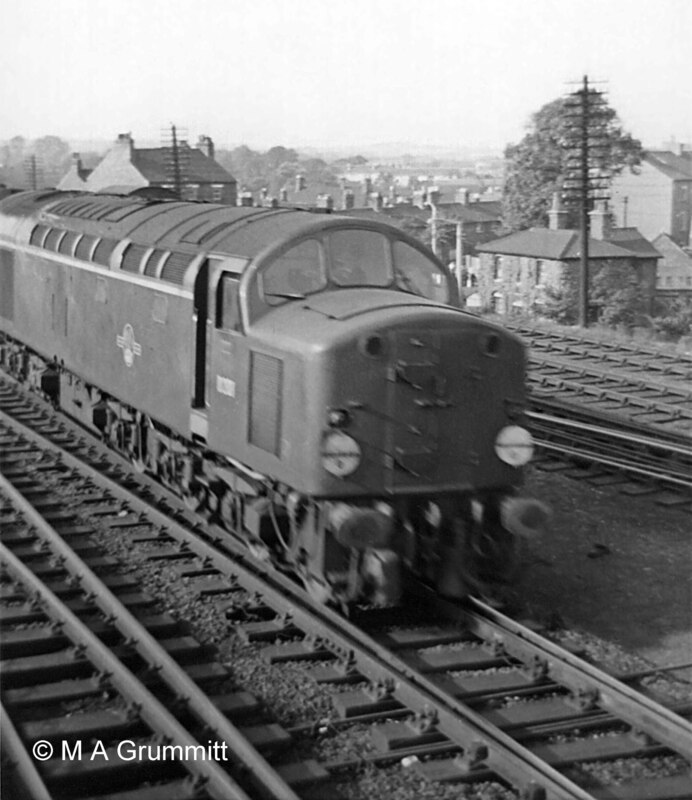 English Electric Type 4 (later Class 40) No. D208 heads south on the Up Main line. 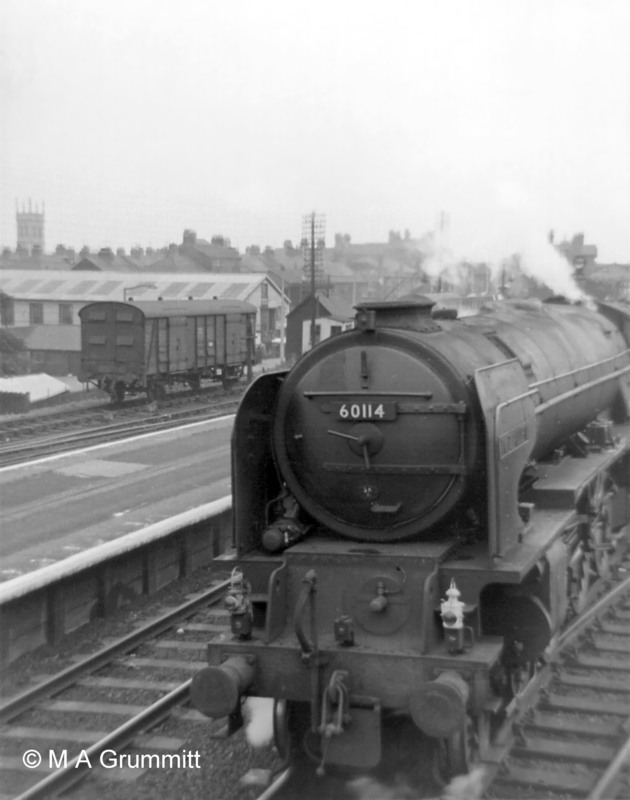 It is hauling an express passenger train, denoted by the two white discs, one above each buffer, which for a time were the equivalent of the headlamps used on steam locomotives. No. 60036 Colombo is moving south off the Nottingham line, heading from Grantham shed to New England at Peterborough. It is carrying the headlamp code for a light engine – one lamp at the centre, above the coupling hook. Each locomotive crew was required to have two headlamps aboard as a vital part of their equipment. Here the second lamp would be on the rear of the tender, acting as a tail lamp. It was, and still is, obligatory for every train to show a tail lamp. If a train or a locomotive passes a signal box and there is no tail lamp it will be stopped because it is an indication that the train may have become divided. No. 60109 Hermit is moving south off the Nottingham line and is probably heading from the shed to the engine siding at the Yard Box to take over a London-bound express. It is carrying a technically incorrect headlamp code because a lamp over the right buffer signifies Class J, a through mineral or empty wagon train. 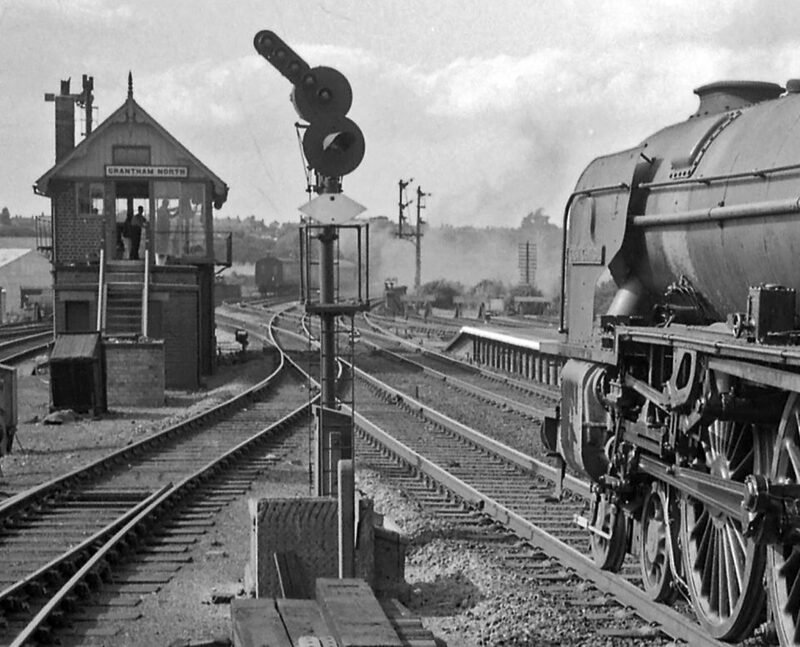 Carrying the single front lamp in this position, however, meant an easier job for the fireman on taking over an incoming train because he only needed to bring the tail lamp to the front left buffer, easily done from the platform, to convert this to the express passenger headcode. Class A1 No. 60114 W P Allen starts an express for the north. In the siding is a 4-wheeled covered carriage truck (known on the railways as a ‘CCT’), a van equipped with end doors so that a road vehicle could be driven inside from a loading dock. Grantham station had such a facility at the end of this siding, north of the main station building, with access from Station Road. No. 60028 Walter K Wigham moves off northbound. Part of the CCT seen in the above photograph is visible again on the far left, with the end-loading facility for road vehicles in the background. The time would be about 1.45pm because walking along the platform is Barry Booth, another Telegraph Lad who is about to relieve Mick in the North Box at the 2pm shift change. Barry is the son of one of the downside station inspectors, Walter Booth. No. 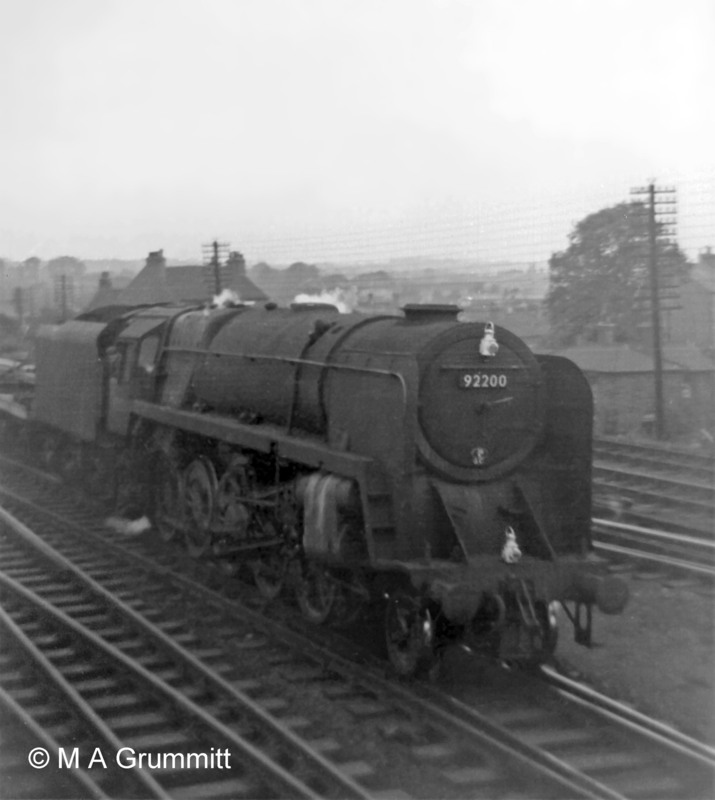 92200 of Doncaster shows a Class H headlamp code for a through freight or ballast train. 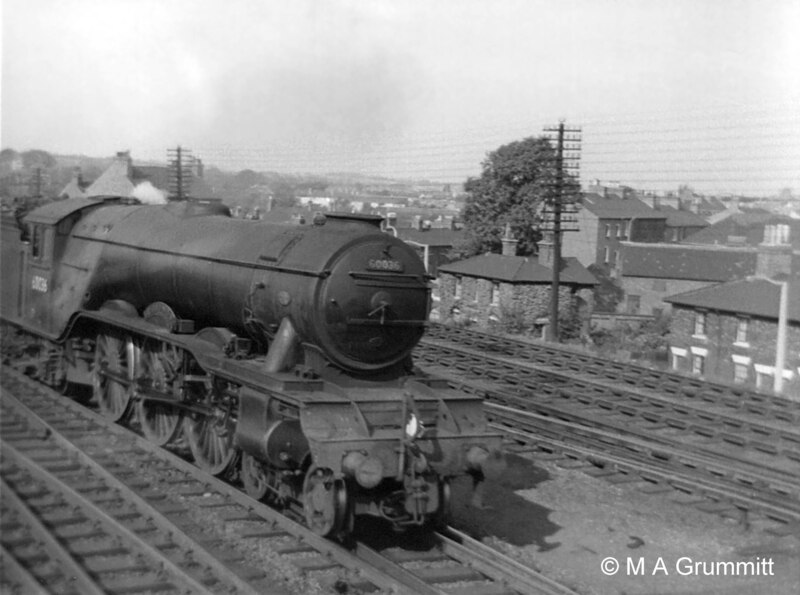 This locomotive, completed at the end of 1958, was in service for less than seven years. This is No. 60013 Dominion of New Zealand on its way to the Yard Box engine siding to take over a train for King’s Cross. Here is train No. 266, the ‘Scotch Goods’ from King’s Cross Goods Yard to Niddrie in Edinburgh, resuming it journey after stopping to take water on the Goods line. 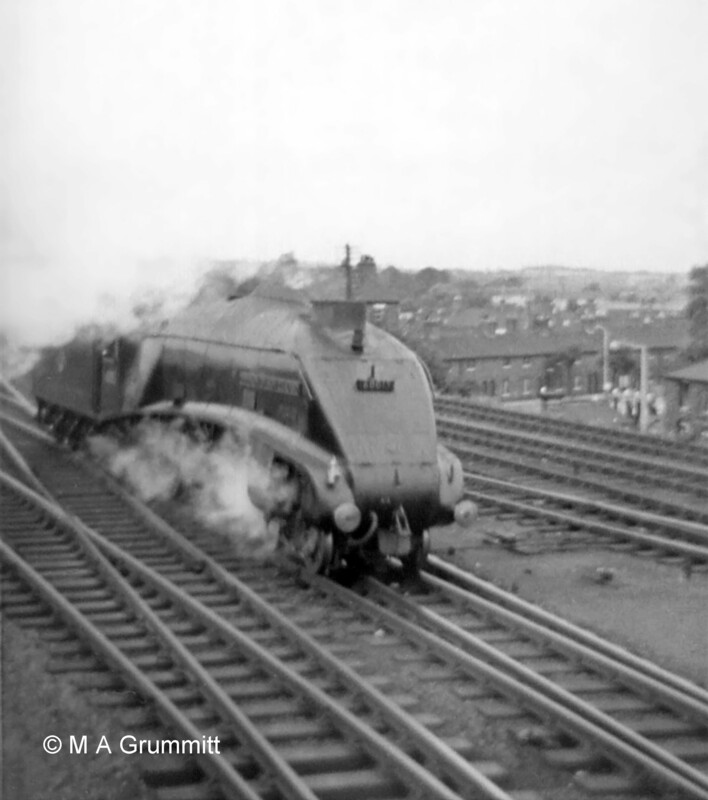 The fireman of this train would normally have refilled its tender at Werrington water troughs just north of Peterborough, and it would rattle through Grantham at speed on the Main line. 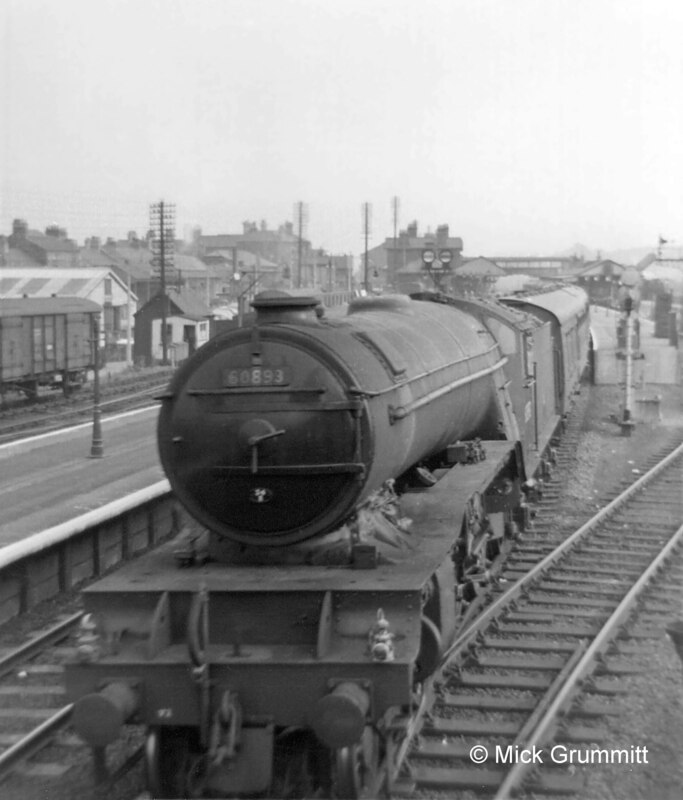 On this occasion Werrington troughs were out of action for repairs so it was booked to stop at Grantham for water. 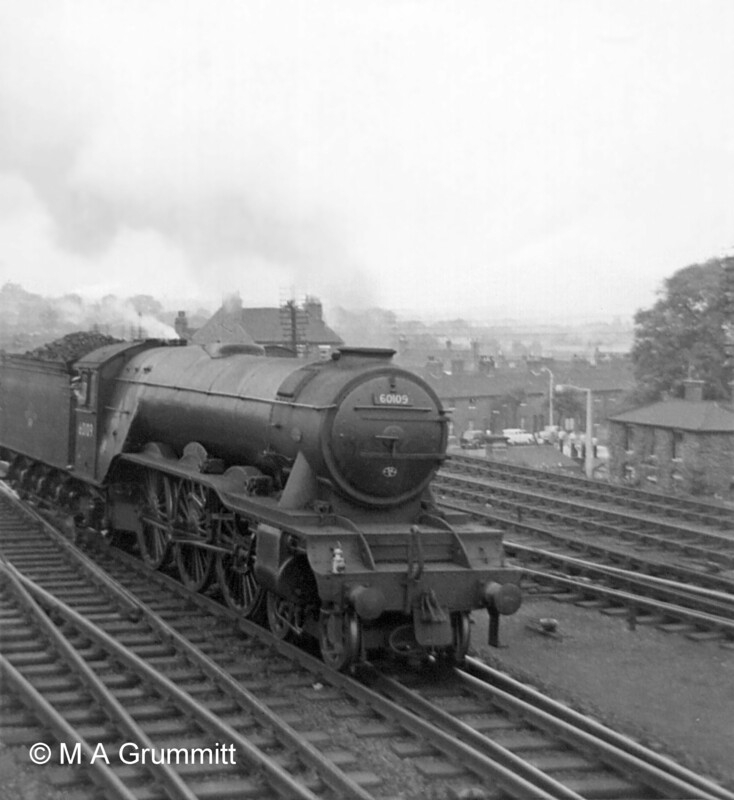 No.60010 Dominion of Canada. The interior of Grantham North box at night, looking north. Just visible is signalman Albert Steptoe. 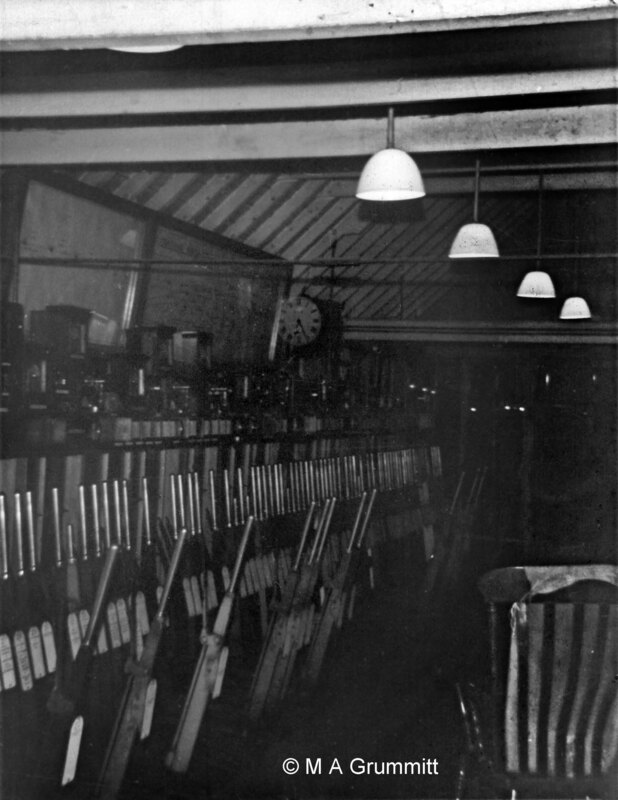 The interior of Grantham North box at night, looking south.